During the year in review our numbers increased significantly to 34 which means we are now above the number I consider to be manageable. I have notified the Executive that we will no longer accept transfers/new starters from outside the Group. The 20th anniversary of the start of Challenger Troop occurred during the course of year. Similar to last year, we once again decided to camp at Spinnaker Lake. 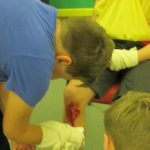 Activities included a hike, a night hike, geocaching, rocket launching, kayaking, rafting and a visit to the inflatables at the Cotswold beach. However, one of the standout activities was probably cooking our lunch on a raft! 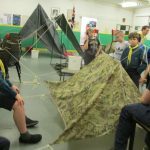 Our Outdoor Challenge Award camp at Horley, near Banbury has now become a tradition, which is great because who doesn’t enjoy cooking on open-fires, playing wide games and building and sleeping in bivouacs? We also carried out a service project for the camp site. We missed out on the ‘Strategy’ weekend at Cirencester Park as it sold out very early – we haven’t made the same mistake this year! At Easter, a small group of us joined with our Explorer unit for a week on a canal boat and we travelled around the Warwickshire Ring and visited Cadbury World. As usual we organised lots of hikes, including day hikes, night hikes, Jamboree on the Trail and NOT the Sarsen Trail. This was because at very short notice the MoD withdrew permission for the Wiltshire Wildlife Trust to organise the hike across Salisbury Plain. 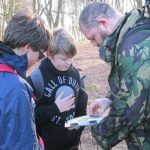 We decided to organise our own 20-mile hike in support of WWT and raised £530.00. A magnificent achievement for the relatively small number of us who took part. We have worked towards the DIY, Digital Maker and Firefighter activity badges. 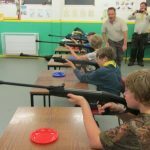 We have thrown axes, had fencing lessons, tried archery and rifle shooting. We played wide games and went geocaching alongside the canal. 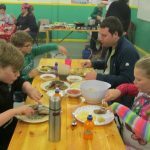 We cooked on wood fires by the canal, as well as cooking pancakes, tasted unusual international foods and tried a ready, steady, cook style evening. After our Christmas meal we treated ourselves to a visit to the ten-pin bowling centre. 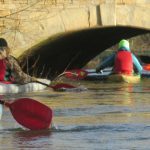 We offer regular kayaking sessions at Spinnaker Lake as well as at least one opportunity for everyone to build and paddle a raft. We had a ‘taster’ session of cycle speedway ahead of the District competition. We hosted the District Cooking Competition and finally managed to enter a team – actually two teams! 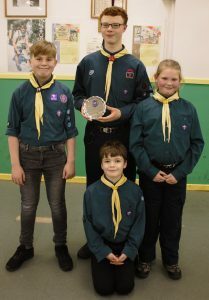 And one of the teams managed to make “the best sweet” in the District and won a trophy for their efforts, although they did not manage to finish on the overall podium. We also hosted the District Rifle Shooting competition and entered 2 teams and we entered teams in the Cycle Speedway competition and in the Chess competition. What better way to get a real flavour of our Scouting adventures than with a few photographs! As always, I would like to thank our team of dedicated Leaders.